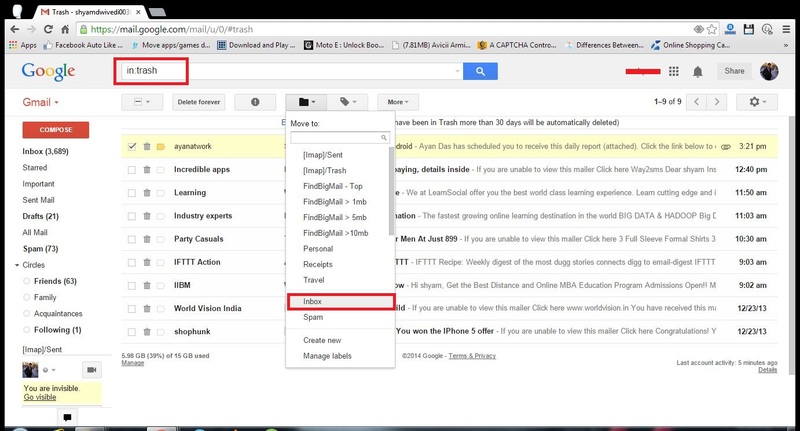 Gmail : How to restore deleted mails ? Internet email services such as Gmail allows users to retrieve mails that have been deleted within a certain period. Gmail holds all the emails that have been deleted in the folder marked as Trash. When the mails are purged from the Trash folder of Gmail they are permanently deleted. To restore the required emails, these can be moved from the Trash folder to the Inbox using the "move to inbox" option. It should be noted that the Trash folder holds emails that have been deleted in the last 30 days. With this feature in Gmail, it is possible to restore emails that may have been deleted accidentally. I've deleted all of my emails from my Gmail account and I want to recover them! What should I do? 5th step: choose the mail you want to recover the click "move to inbox"